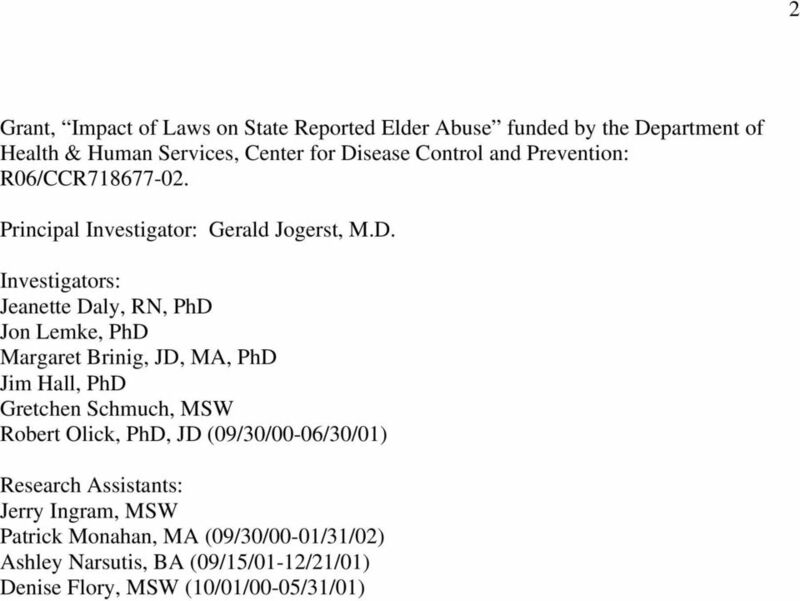 Download "Summary of the State Elder Abuse. 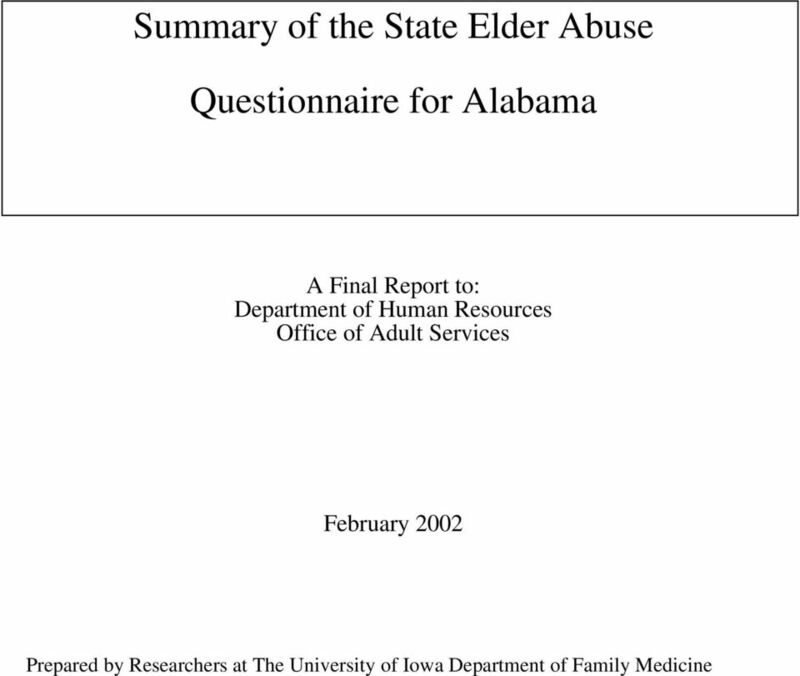 Questionnaire for Alabama"
3 3 Elder Abuse Investigations: Alabama Results In September 2000, a research team at the University of Iowa was awarded a grant to investigate domestic elder abuse at the national level. This two-year award was made possible by funds from the Center for Disease Control and Prevention. 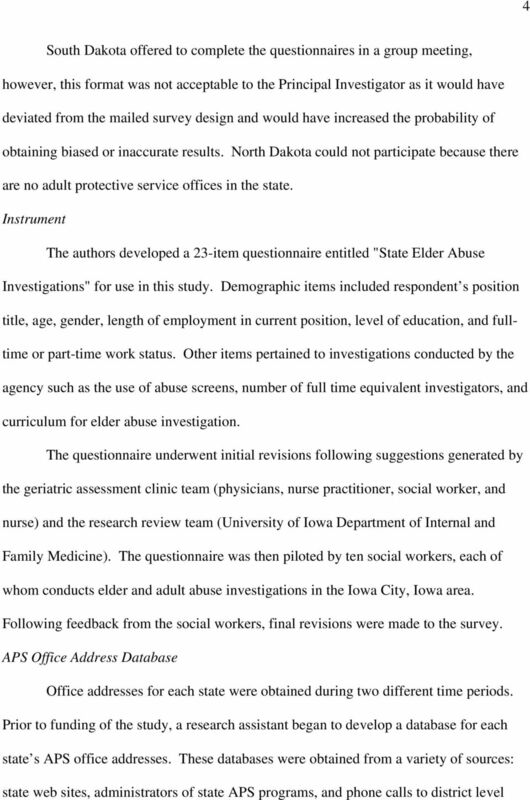 The overall purpose of this project was to evaluate the impact of state Adult Protective Service (APS) legislation on the implementation of the investigative system for elder abuse. One of the specific aims was to differentiate investigative structure and investigator characteristics at the reporting district level for all 50 states and the District of Columbia. 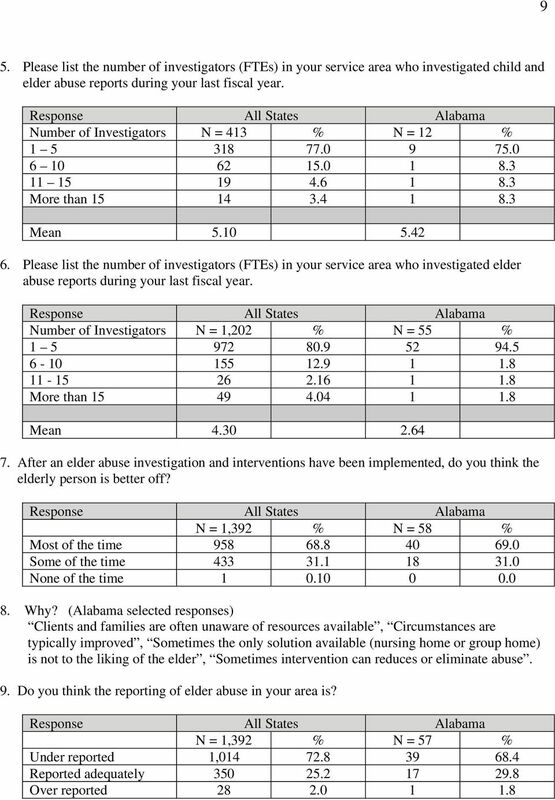 Methods Study Participants A mailed survey was used to accomplish the aim of differentiating investigative structure and investigator characteristics. 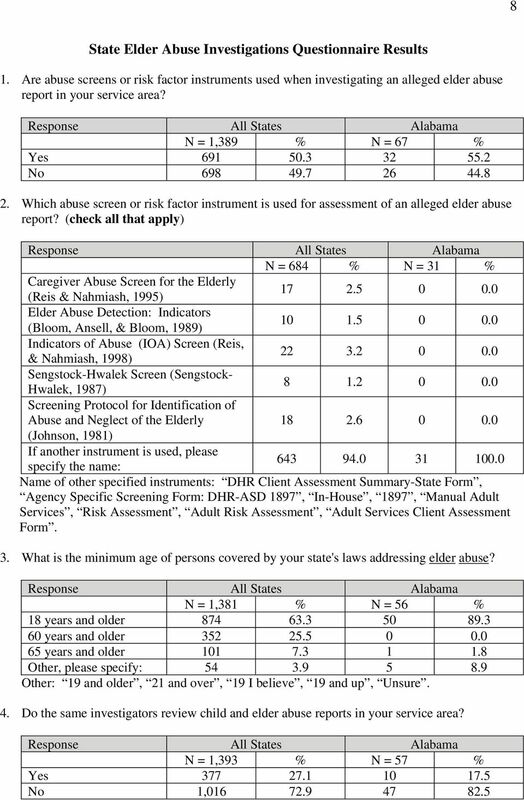 Prior to mailing, permission to conduct the survey was sought from each state's administrator of Adult Protective Services. 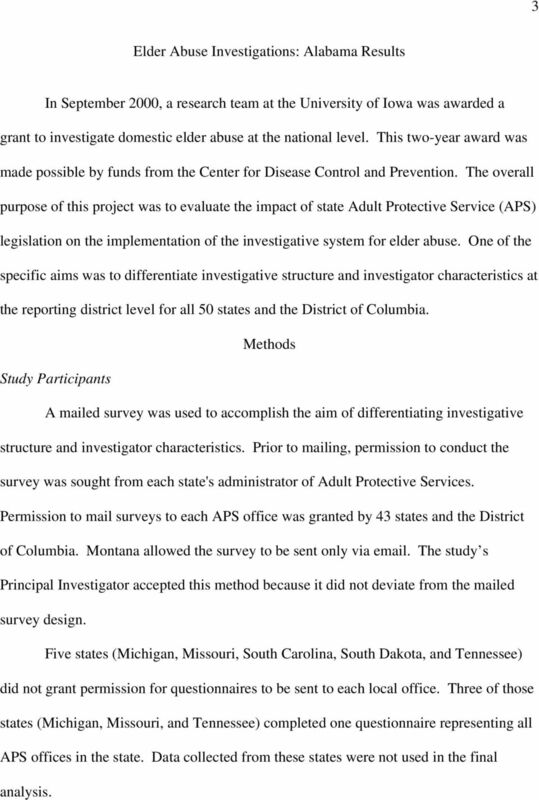 Permission to mail surveys to each APS office was granted by 43 states and the District of Columbia. Montana allowed the survey to be sent only via . 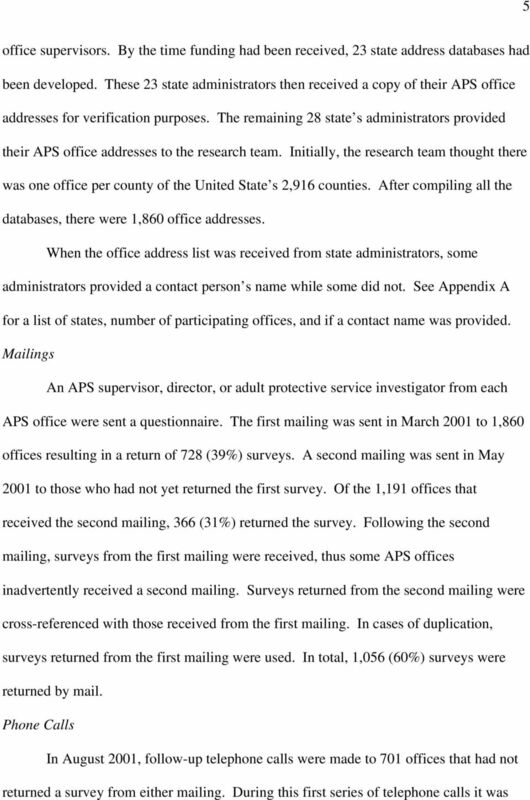 The study s Principal Investigator accepted this method because it did not deviate from the mailed survey design. 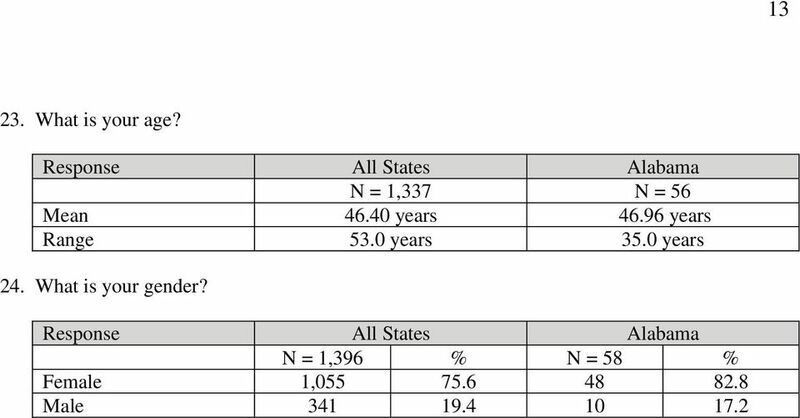 Five states (Michigan, Missouri, South Carolina, South Dakota, and Tennessee) did not grant permission for questionnaires to be sent to each local office. 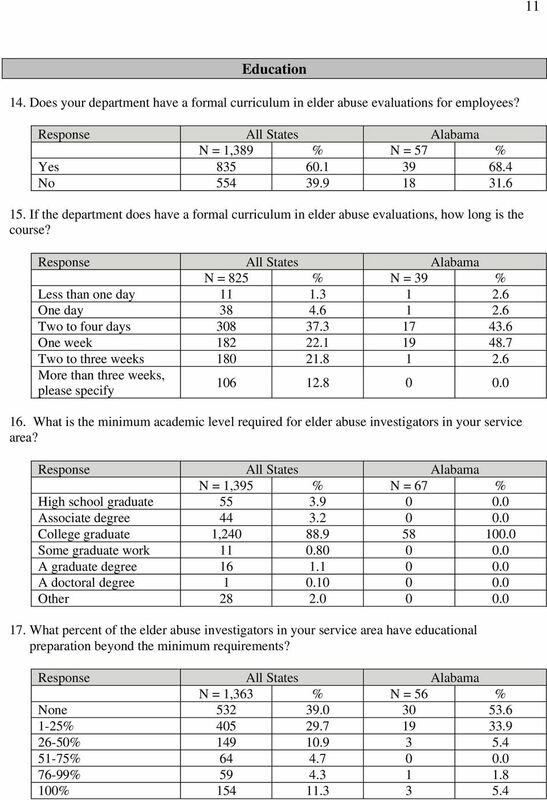 Three of those states (Michigan, Missouri, and Tennessee) completed one questionnaire representing all APS offices in the state. 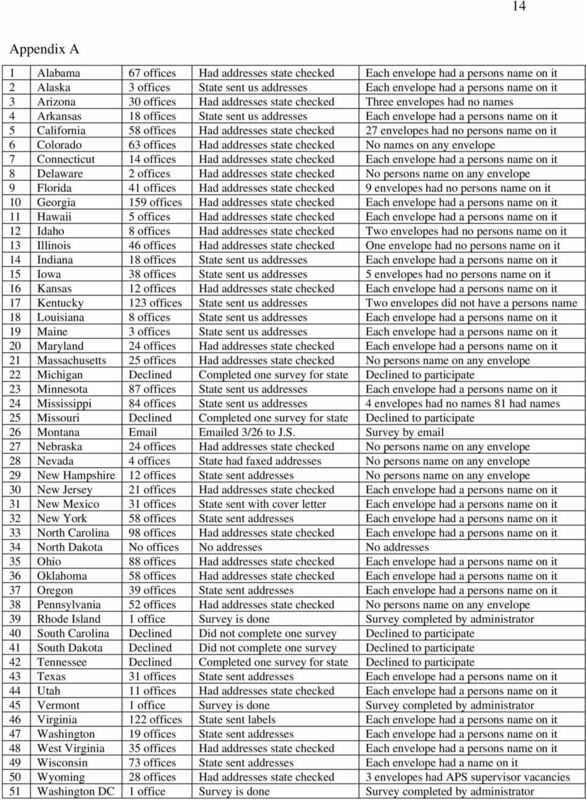 Data collected from these states were not used in the final analysis. 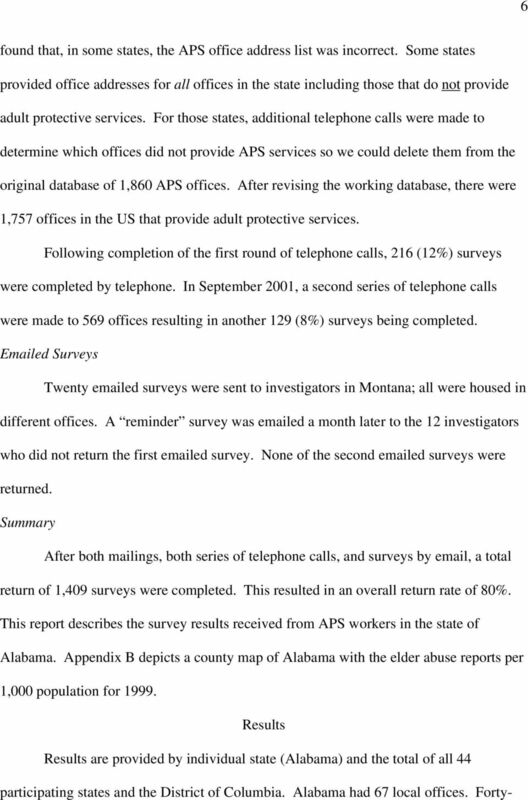 7 7 six (69%) questionnaires were returned by mail and twelve (18%) were completed by telephone. 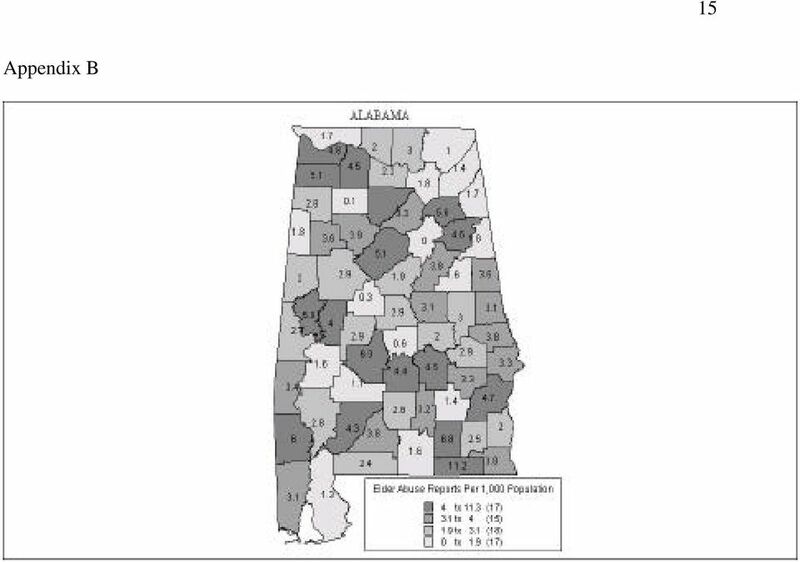 There is an 87% return rate for the state of Alabama. 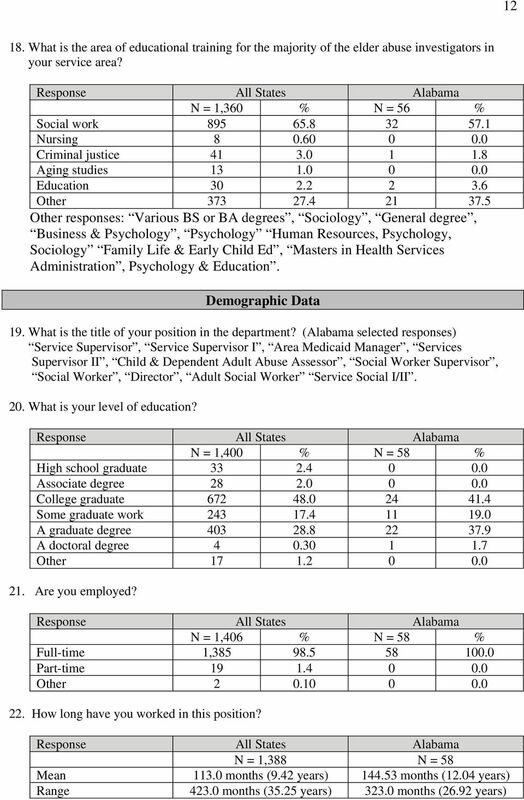 Nationally, the average respondent was female, 46 years old, working full-time with a college degree and had been in their current position for nine years. 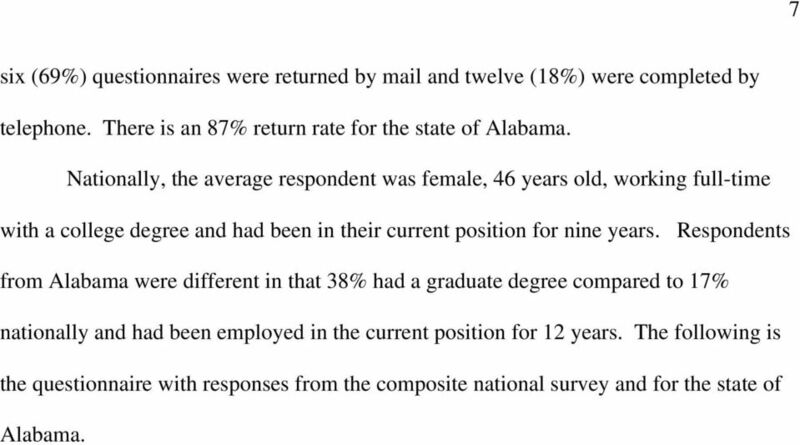 Respondents from Alabama were different in that 38% had a graduate degree compared to 17% nationally and had been employed in the current position for 12 years. 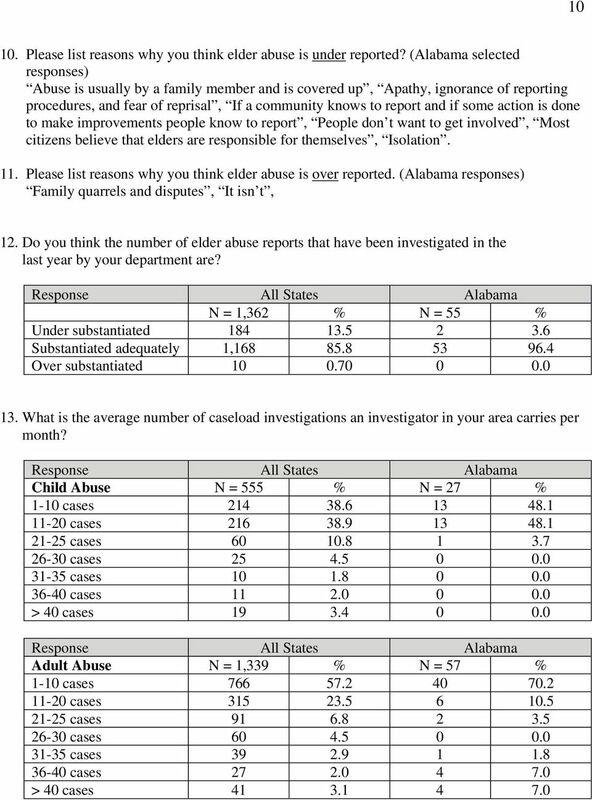 The following is the questionnaire with responses from the composite national survey and for the state of Alabama.